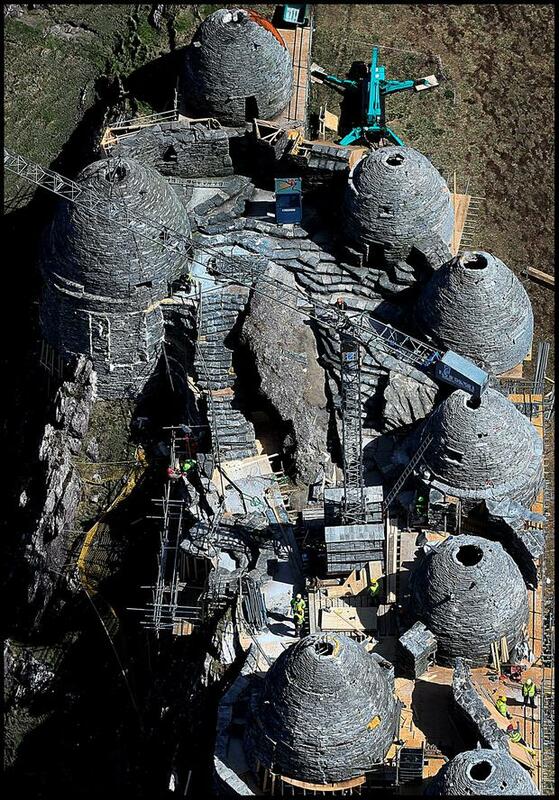 Exclusive: The almost completed film set of an ancient Jedi Temple under construction at Ceann Sibeal in Kerry for the making of Star Wars Episode VIII. 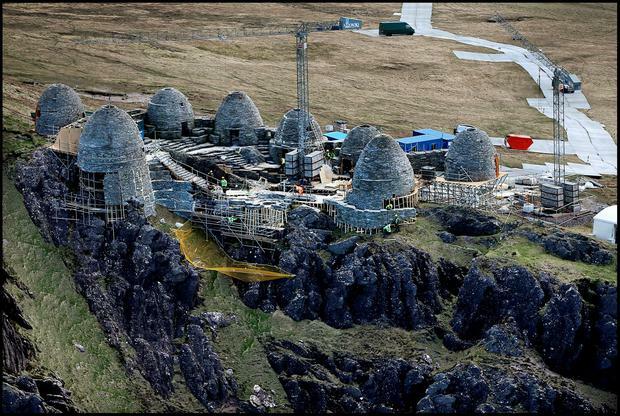 The almost completed fim set of an ancient Jedi Temple under construction at Ceann Sibeal in Kerry for the making of Star Wars Episode VIII. The Jedi are returning to Kerry - but this time they won't be spending time on Skellig Michael. A replica of the sixth-century monastic settlement has been recreated on top of Ceann Sibéal on the Dingle Peninsula, ahead of 'Star Wars' filming later this month. The intricate structure comprising eight beehive huts has been built on scaffolding on a raised stage with steps going down the centre. Our exclusive photographs show how closely the set resembles the settlement on the Unesco World Heritage Site at Skellig Michael, which was used for filming last year. One of the huts appears as if it is hanging precariously off the side of a cliff - and netting has been placed underneath as an added safety measure. Work on the site started about six weeks ago and has been completed in several stages. The first of these was the laying of the 1.5km metal track to facilitate access to the clifftop, followed by the construction of the set. The latest addition has been a number of marquees. In the closing moments of 'Star Wars: Episode VII - The Force Awakens', the majestic Skellig was used as the backdrop to the climactic scene. Luke Skywalker, played by Mark Hamill, was eventually tracked down to the isolated outpost by Rey, played by British actor Daisy Ridley. Both actors are expected to make a return to Kerry this month, along with other cast members, to shoot scenes on the newly constructed set. The site is supposed to be the planet Ahch-To, home to the First Jedi Temple where Luke Skywalker has been in exile. It briefly appeared in the recent 'The Force Awakens' movie but is tipped to play a far bigger role in the next instalment, as Rey is expected to begin her training with the Jedi master. It is just one of several locations along the western seaboard being used, as 'Star Wars' producers seem to have fallen in love with Ireland. Ceann Sibéal also poses fewer headaches for Disney LucasFilm than Skellig Michael did, mainly for conservation reasons. And in March, the Department of Arts, Heritage and the Gaeltacht granted permits for "a limited amount of filming by a film production company on Ceann Sibéal/Sybil Head on the Dingle Peninsula later this year". It said its National Parks and Wildlife Service was satisfied the filming would have no adverse effect on local biodiversity, or the Special Protection Area. However, the letter of consent includes strict criteria for filming, limiting helicopter use to three days and filming 100m from the cliff top to 45 minutes in any one day. The number of personnel working on site has also been limited to 100. Kerry County Council confirmed the set was an "exempted development" that did not require planning permission because of its "temporary nature". This means it will be dismantled once filming wraps, which is expected to ensure at least a few more weeks' work for those employed on site. An approach has also been made to the owners of some 4x4 vehicles locally, asking if they'd consider renting their vehicles for the purposes of transporting cast and crew to the top. The set's location, on private land about 2km from Ballyferriter village, has also been helpful and a security hut on the road owned by Denis Curran is manned around the clock, keeping nosey visitors at bay. But they still come - and in their droves. The manager of nearby Ceann Sibéal Golf Club in Baile Uachtaracha, Steve Fahy, says although there's a lot of goodwill towards the project locally, it's causing challenges for the club. "It's costing us money right now because of the number of cancellations we're getting," he said. "We've had societies and smaller groups that were booked in to play cancelling because they can't find accommodation in the area. The hotels and B&Bs are booked out." 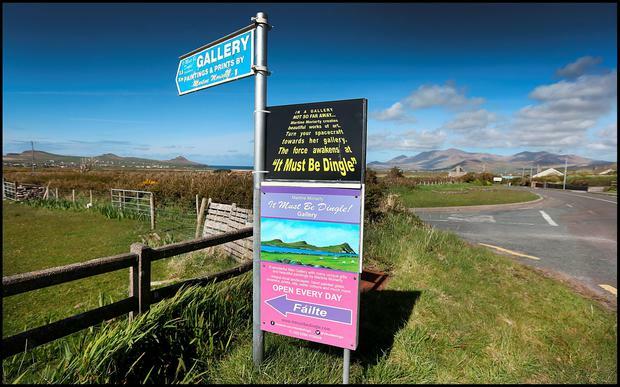 In the long term, he feels it will be a positive for Ballyferriter, which is about 14km west of Dingle, and will encourage more visitors to stay in the area. "We'll have to dream up some marketing gimmick and we intend to send some sort of an invitation to them to have a round of golf on us. "The best thing of all will be when a certain cailín (Ridley) takes her first swing on the green." Publican Dermot Sears, who owns Tig an tSaorsaigh in Ballyferriter, says he's already had a lot of international tourists calling into his premises inquiring about 'Star Wars'. "It's the best thing that ever came since 'Ryan's Daughter' and hopefully it will give the place plenty of publicity and we'll have tourists flocking to the area," he says. It has been more than 45 years since film director David Lean and his crew came to the Dingle Peninsula to shoot the epic 'Ryan's Daughter', starring Robert Mitchum. Although the film was slated by critics, it won two Academy Awards and showcased the beauty of west Kerry to an audience around the world. Dingle restaurateur John Moriarty of Lord Baker's on Main Street was a young chef working in the Skellig Hotel at the time. "Where I see the importance of 'Star Wars' is that it's in the Ballyferriter area and it's good that they get a shot in the arm because these areas still have a very quiet winter. The benefits down the road are enormous and I know what 'Ryan's Daughter' did for Dingle. "But I think 'Star Wars' is so huge it will have knock-on effects for many years to come and people will keep coming in bigger numbers and we should be very grateful for that," Mr Moriarty said. Parts of Pinewood Studios are also tipped to double for Skellig Michael in the final production. Leaked photographs released at the weekend showed the iconic Millennium Falcon spaceship parked on rocky terrain with lush, green vegetation. It has all been set up at the film studios in Buckinghamshire. There are all kinds of good and interesting ideas woven through Neil Jordan's latest film. Once again he, this time with co-writer Ray Wright, has crafted a female led story and that's always enjoyable to see too. Unfortunately, it doesn't quite deliver on its promise partly because it doesn't totally commit to being the 1990s thriller it sometimes seems to want to be, but it is entirely watchable.